Stock photo of towers and architecture of the Burg Ronneburg (Burgmuseum), Ronneburg Castle, at dusk, Ronneburg, Hessen, Germany, Europe. Close view of towers and architecture of Burg Ronneburg in Ronneburg Castle, Ronneburg, Hessen. This stock photo shows rough stone towers and the decaying architecture of the Burg Ronneburg (Burgmuseum), Ronneburg Castle, at dusk, Ronneburg, Hessen, Germany, Europe. A close view shows the deteriorating stone tower with its pointed spire roof. A couple of windows sit high in the tower’s round wall. 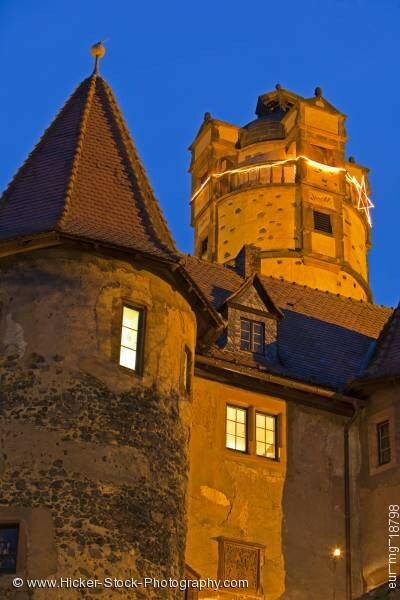 Behind the tower is the Ronneburg Castle with outside lights glowing on its rough stone and stucco walls. A small gabled window blends in with the tiled roof of the castle. Just behind the castle wall sits another stone tower. The round tower in the background has a unique construction at the top has gabled structures added to the side of its dome. The dome’s stone wall is trimmed in wood. A string of lights is draped on the railing around the tower along with a Christmas star. Towers and architecture of the Burg Ronneburg (Burgmuseum), Ronneburg Castle, at dusk, Ronneburg, Hessen, Germany, Europe.